There's little more comforting than homemade Chicken and Dumplings. This recipe is a slight twist on the classic version. The recipe begins with a couple of chicken breasts simmered until tender in a rich, savory broth. Next, the broth is thickened with a cornstarch slurry and a splash of heavy cream. 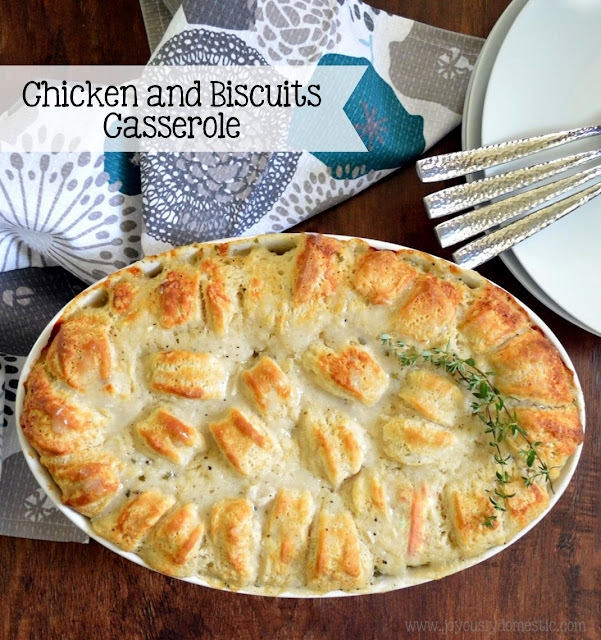 Then, instead of dropping biscuit dough into the thick, steamy broth to cook on the stove top, the chicken and "gravy" is loaded into a casserole dish, topped with half-moons of buttermilk biscuits and popped into the oven to bake to golden, bubbly bliss. The result is the familiar flavors present in classic Chicken and Dumplings, of course, But, the biscuits are taken to new heights due to the browning on top of the casserole. The bottoms of the biscuits bake up - moist and soft - submerged in bubbling gravy while the tops of the biscuits puff up to golden, magical perfection. Bring 8 cups of hot water to a boil in a large soup pot over high heat. Add in bouillon cubes, poultry seasoning, Herbes de Provence and chicken breasts. Reduce heat to medium. Poach chicken around twenty minutes or until meat is cooked through. Transfer chicken to a plate or cutting board. Carefully shred with two forks. Return chicken to cooking broth. Increase heat to high. Whisk 1/2 cup COLD water with cornstarch in a small bowl until no lumps remain. Stir cornstarch "slurry" into the simmering broth. Cook 5 - 10 minutes while broth slightly thickens and returns to a boil. Stir in heavy cream. Allow liquid to simmer for another 5 - 10 minutes until it resembles the consistency of gravy. Stir in pepper. Taste and add salt as needed. Place dish on a foil-lined sheet pan to catch any drips. Bake for 35 - 45 minutes (or until casserole is bubbly and tops of biscuits are lightly browned). NOTE: 1 cup of frozen-style mixed vegetables that have been thawed can be added into gravy if desired. Oh, no. That's not good. I am not sure what may have happened ... never had that issue. Perhaps a little more cornstarch and/or letting it thicken on the stove a tad bit longer. It really is an excellent dish ... we make it regularly and have served it to guests with great success, too. I am sorry you have had trouble. So happy to hear that you gave it a go another time ... and had success! Yeah! I am pregnant and was looming at tbis ladt night at like 2am. If i had the ingredients I would have made and devoured it. I can not wait to try next weekend. So happy no canned soup, or canned biscuits. Hi, Melissa. This is a dish that I just crave sometimes. And, I'm not even pregnant. :) I hope you enjoy it if you get a chance to try it. Very good flavor but mine was soupy too, following the recipe exactly. I then added twice as much cornstarch slurry, still soupy, then made a flour slurry with 1/3 cup flour and cream. This helped but was still not a gravy consistency. Trying to thicken took me well over an hour as i had to keep adding thickeners and waiting to see if it would thicken. More chicken is necessary for this large of a dish, as well. HI. What size baking dish did you use? Sounds great! I usually use a 3 - 4 quart oval casserole dish. But, I have used a 9 x 13 rectangle baking dish and it worked great as they are about the same size-wise I believe. Hope that helps. Literally had the same problem as everyone else. I started with twice the cornstarch after reading the comments. Had to add four times as much as called for and still nothing. I have no idea how you could ever have made this work as written.